Our mantra while on furlough last week: If we couldn’t laugh, we would all go insane. Over at our home blog — AM, Then FM — we took our lemon and made lemonade. We spent the week spinning vintage comedy bits, mostly from the ’70s. When it came to my National Lampoon records, which I’ve had since the ’70s, I went with a couple of pieces from “Radio Dinner” rather than something from “Lemmings,” the Woodstock satire best heard in its entirety, and thus in context. Likewise, there’s only one way to listen to the great Rodney Dangerfield. To bring it over here, to The Midnight Tracker, to capture what his weary yet rapid-fire stage persona was like. We saw Rodney Dangerfield do a live show in a Vegas-style dinner theater here in Green Bay in the early ’80s. It must have been 1980 or 1981. I remember none of the jokes. They came much too quickly (and I’m sure Rodney would find a joke in that line). That said, I vividly recall laughing from almost the minute Rodney walked on stage to the minute he walked off. 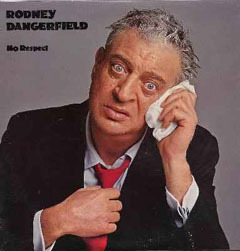 “No Respect,” Rodney Dangerfield, from “No Respect,” 1980. This is Side 1, one long cut. It runs 18:46. Recorded live at Dangerfield’s nightclub in New York City. I pull out the record to double-check something and I see there is no sleeve. No respect, I tell ya. I haven’t seen a lot of comedy shows over the years. Rodney Dangerfield was the first comedian I ever saw live. Hard to top that. We saw Bill Hicks at a comedy club in Memphis one night in the late ’80s. He was on his way up. That came close. Yeah, we’re done here tonight. You’ve been a great crowd.